The school snack line is the perfect place to see the abundance of unnecessary packaging. 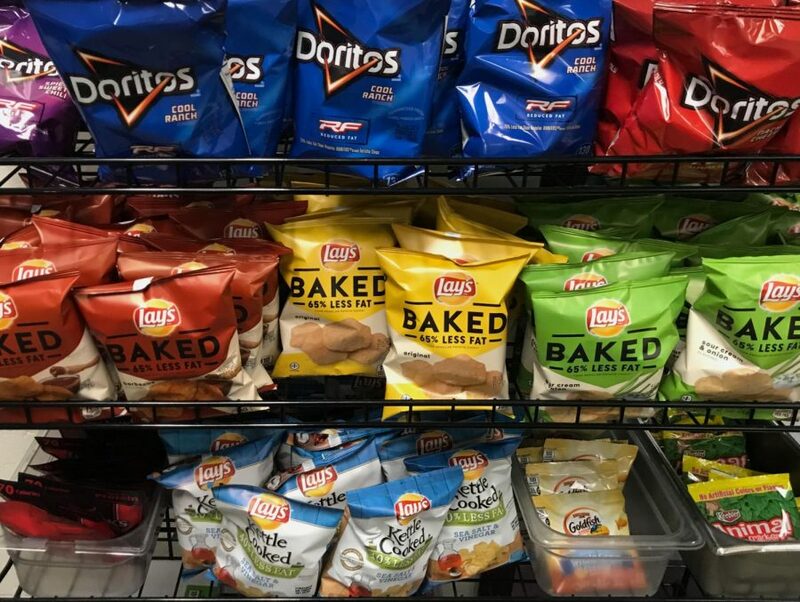 From chips to beef jerky, everything is packaged in large. Often times, this packaging can be excessively large for the sole purpose of advertisement space. “I think as a society, we are used buying a lot of packaged goods that come in containers, whether that's food packaging or products on Amazon,” said Carson. Municipal solid waste (MSW) management is a hot topic these days, especially within the growing realm of environmental health and climate change conversations. Current methods of waste management include landfills and incineration, both of which have the potential to harm the environment and human health. It is these effects that make waste management an important and pressing issue. “Part of what makes landfills harmful is the leaching of harmful materials into the ground. A lot of [waste] potentially has metals or other chemicals that could enter the groundwater,” said Camille Carson, the AP Environmental Science teacher at HBHS. When these chemicals enter groundwater, they can end up being ingested by aquatic organisms, as well as humans. Additionally, landfills can contribute to climate change. “Another piece is that sometimes there’s the production of methane gas, which is a greenhouse gas,” said Carson. As organic material such as food waste decomposes without oxygen, methane is released- a process that can be avoided by implementing composting. Above all, however, the biggest problem with waste management is the mindset of consumers. Consumer societies have shifted towards a ‘throwaway’ culture, in which the consequences of discarding items are out of sight and out of mind, explains Martin O’Brien, a sociologist at the University of Central Lancashire. The result is a cycle of disregard for waste and harmful effects on the environment. If this cycle is to be ended, the way in which individuals think about consuming and producing waste must change as well. As someone aware of these issues, I usually recycle and reuse items, but only when it is convenient to do so. After researching more and understanding the true scope and severity of current waste management methods, I decided to try and change the way I consumed. For a week, I would be conscious of what I was consuming and would make informed decisions to minimize my waste. Soon after I began my week-long endeavor, I quickly realized how much unnecessary waste I was consuming. At the grocery store, crackers are double wrapped under thick plastic bags, sealed in cardboard boxes, then placed in a bag at checkout. Even in the produce department, bell peppers are placed on Styrofoam plates and wrapped in saran wrap. At school, the struggle continued. The Styrofoam lunch trays and plastic utensils forced me to pack my own lunch, of which I tried to keep to mostly fruits and vegetables to avoid packaging. Additionally, there was no option to compost food waste here at school. As the week continued, however, I began getting into a routine and the process became easier. I set up a system for composting at my house to decrease my food waste. At school, I kept my organic food waste in a separate bag until I could compost them at my house. Even at Starbucks, where disposable cups and straws seem inevitable, I was able to bring a reusable mug to be refilled. For many consumers, the idea of eliminating all waste is not attainable. “I definitely couldn’t. 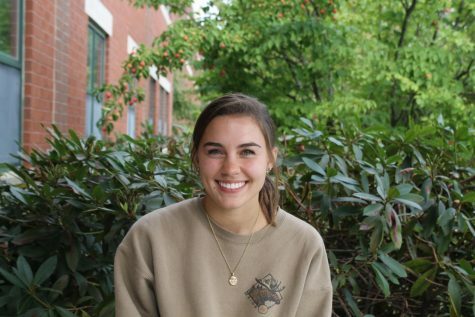 It’s only attainable if you’re willing to devote your entire life to it,” said Kyra Belden ‘19. However, perhaps the answer to the issue of waste management is less severe. A simple change in mindset about how we consume is the first step in ending the cycle of the throwaway society. “I think awareness is big,” said Carson. “Try for a week to decrease waste or cut waste in half. Once you have a visual of how much waste you’re producing you can have a better sense of what needs to change,” said Carson.